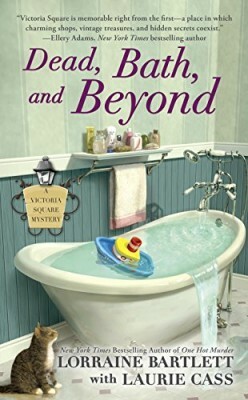 Details at the end of this post on how to enter to win a copy of Dead, Bath, and Beyond. We also have a link to order it from Amazon, and from an indie bookstore where a portion goes to help support KRL. Until she ran into her former boss from Kimper Insurance, Katie Bonner had been having the perfect Labor Day in McKinlay Mill. Only Josh Kimper could have ruined what was a perfect day of sailing around Lake Ontario, as he had lost none of the arrogance, misogyny, or obnoxiousness that had made her life as his office manager hell. Taking over Artisans Alley, a former warehouse transformed into a gallery for crafters and artists, was something Katie had never wished for but discovered was what she needed. Not only is Katie finally making a profit from renting out booths, she is dating her landlord and owner of Angelo’s Pizzeria, Andy Rust. All of that could be jeopardized when Josh’s body is found drowned in a bathtub at Sassy Sally’s Inn, and evidence that he actually died in the waters of Lake Ontario shines an incriminating light towards Katie’s shouting match with Josh. It’s when suspicion falls on the Inn owners, one of whom refuses to disclose his alibi, that Katie’s need to help her friends and find the murderer kicks into high gear. Despite Josh’s gloating and boasts of his business successes, Katie learns that personally his life was not so marvelous. Josh was staying at the Inn after his wife kicked him out of their house and filed for divorce, and the widow is not even close to mourning his demise. Josh also seemed to have left a number of buyers interested in large boats in the lurch, the Inn owners shafted into allowing him to stay for free, and his very attractive new office manager an inconsolable ball of tears. Katie will have to balance her interrogations with managing Artisans alley, like following complaints concerning fumes emanating from the new salon and day spa, the manicurist’s solutions prove to be more destructive than the original problem. The fourth book in Lorraine Bartlett’s Victoria Square series, the transition of being the first co-written with Laurie Cass appears to be seamless. Katie’s relationship with Andy continues to be hampered by the businesses that take up most of their free time, unsatisfying mostly due to the inconvenient sparks she feels with retired Sheriff’s investigator Ray Davenport. Even Andy may be picking up the unspoken vibes, so Katie is relieved to be distracted by the rather unsubtle efforts of two meddling teenaged girls and even a haircut intervention. Katie is a little sensitive concerning her physical state as she enters her thirties, which perhaps explains her prickliness when her investigative efforts are questioned. Fans of the series will be invested in seeing just what Katie’s next step will be in her life, while mystery readers will enjoy unpredictable plot twists and her suspenseful efforts to ingeniously MacGyver her way out of jeopardy. To enter to win a copy of Dead, Bath, and Beyond, simply email KRL at krlcontests@gmail[dot]com by replacing the [dot] with a period, and with the subject line “bath,” or comment on this article. A winner will be chosen December 17, 2016. U.S. residents only. If entering via email please include your mailing address, and if via comment please include your email address. Thanks for the chance to win a copy of Dead, Bath and Beyond. Adore the name —thanks for offer! Sounds good! Thanks hope I win it! So excited that this book is finally out! Just looking at the cover I picture a dead body in that tub!!!! On my wish list….thanks for the contest! 2boys4me (at) gmail (dot) com. Just love this series. 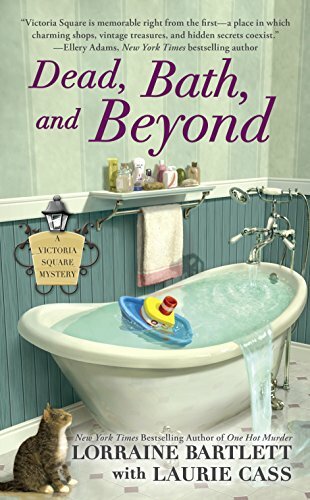 Looking forward to reading Dead, Bath and Beyond. Thank you for your review and a chance to win! Happy Holidays! I really enjoyed the first books in this series and I’m thrilled to see that there’s another one. Oh I love books written by Laurie Cass! This one sounds so good too thanks for the chance to win! This book sounds like such fun. So happy to see a new entry in this wonderful series. New series – not authors – to me and it sounds terrific! Thanks for review and giveaway.